I was so excited to see this weeks challenge theme over at iheartfaces! The theme is yellow and I knew exactly what picture I was going to enter. This is one of my favorite pictures of my daughter. We were at a new park and she was hanging out on this little push cart thing while I was working on some lighting. I looked over and saw her and snapped a picture and I just love it. This will always hang somewhere in my home. A word about those shoes...she wore those things until not only her big toe, but the next one down stuck out through the holes. What is it with kids and crocs! A special thanks to my friend Nicole for handing down those beloved shoes...she has been so generous to us and I think my daughter thinks I do not buy her any clothes, she always asks if anything new came from Lainey. Adorable girl and great photo! Ha ha! I knew when I saw the theme you'd use those crocs! Lainey loved those shoes I know she'd be glad they got the love they deserved. Great shot by the way! I love the backdrop. i love her hair!! what a great shot. So cute! 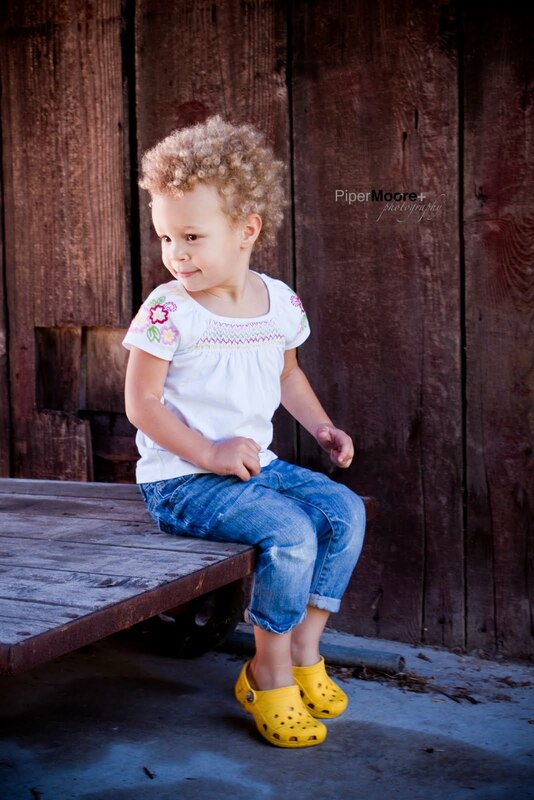 Love those yellow crocs - a great splash of sunny color! Adorable! I love the little pop of yellow! I have red crocks and LOVE them! So fun that you used them in your photo! Wow, another Piper - there are not a lot of us :) Great Picture! Such a clean edit of a really cute girl. She is precious! I love her soft expression and the whole feeling is just sweet. Definitely frameworthy!